Congratulations! you have already made it past you first step in the home buying process just by coming to this site. When you are trying to buy a house in a competitive market, your offer to purchase should contain as few conditions as possible. An offer that is conditional on obtaining financing is often a deal killer. The seller may accept a competing offer for less money rather than take the risk that you won’t be able to raise mortgage money. A pre-approval letter from your lender tells the seller you are ready and able to commit. 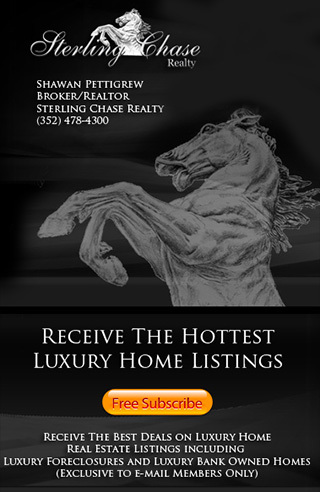 Sterling Chase Realty offers in-house financing at wholesale rates, yes they can even beat your best bank rate. Contact Daniel Pettigrew at 352-404-4622. He can provide you with a FREE no obligation pre-approval and tell you exactly how much home you can qualify for. Once you have determined how much you want to spend the next step is to make a needs list. First item on the list should be location. then go down the line with minimums. Minimum Bedroom, Baths, sq.ft., lot size, gar, etc. Call Shawan Pettigrew at 352-478-4300 and discuss your findings. Shawan will then send you out specific details on homes that match your criteria and set up private showing appointments to view the ones that interest you most. This is considered to be the most stressful point in the buying process. The good news is Shawan Pettigrew is a professional negotiator. She will provide you with competitive market analysis that will be vital to you getting the absolute best deal. From here it is all downhill Sterling Chase Realty will hold your hand through the entire closing process and make sure everything runs smoothly. All you will need to worry about from this point is: who's going to help you to move.